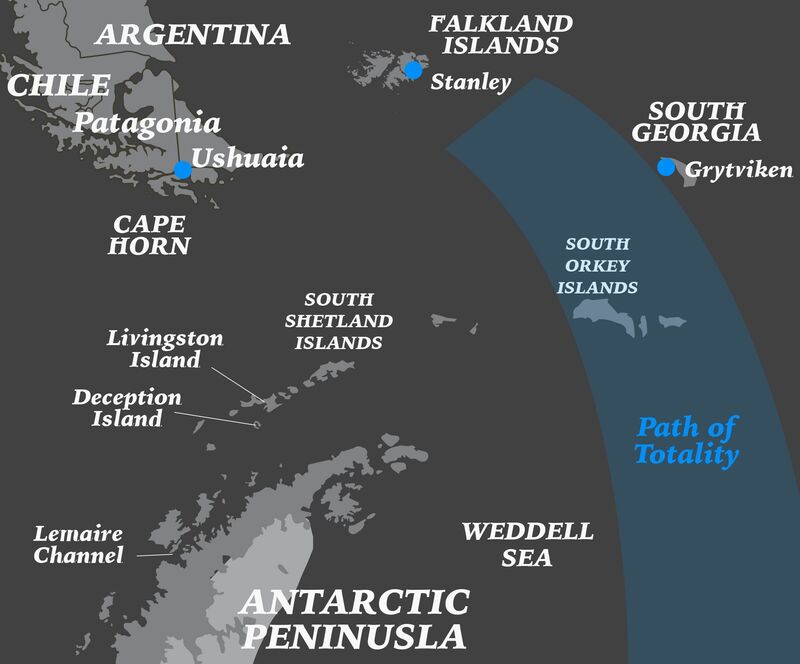 Eclipse Travel are delighted to invite you to join us on one of our tours to view the upcoming solar eclipses in South America in 2019 and 2020 and then in Antarctica in 2021. 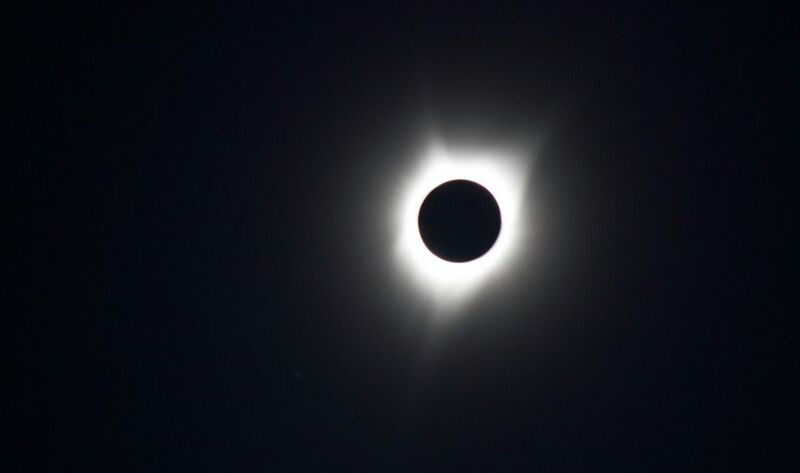 The next total solar eclipse will occur on July 2, 2019 in Chile and Argentina and full details of our touring options will be released in September 2017.Further details on the next Solar Eclipse can be found below and if you are interested in witnessing these incredible events please register your details so we can keep you updated on our arrangements. 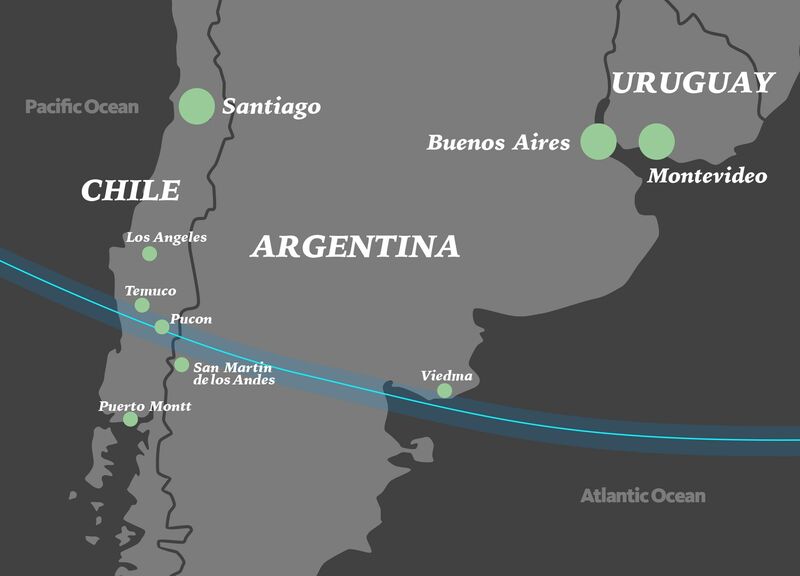 Weather records indicate that the best place to view the eclipse will be inland from La Serena in Chile and also close to San Juan in Argentina as indicated by the above map. There are several observatories in this region which offer incredible stargazing due to astoundingly clear skies. On this shorter version of our eclipse tour you will experience the same once-in-a-lifetime opportunity to see the solar eclipse in La Serena, one of the best places to watch this phenomenon, in addition to visiting the vibrant cities of Santiago and Valparaiso. Last spaces remaining, don’t miss out! Experience an astronomical sighting of the Solar Eclipse in Argentina in this amazing 11 small group tour. 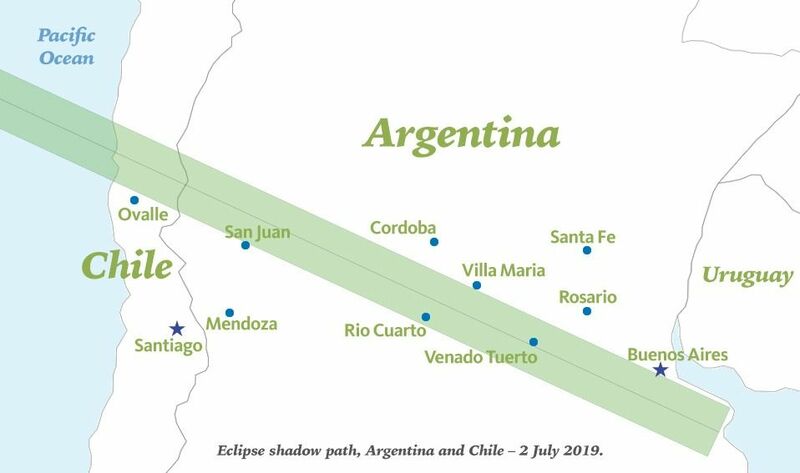 Visit the alluring town of Buenos Aires, the Moon Valley, Cafayate vineyards, and experience the rare astronomical viewing of the Total Solar Eclipse in the environs of Argentina’s stunning backyard. Last room remaining, don’t miss out! Experience the best of central Chile on this 8-day escorted tour. Visit the lake district and marvel at the imposing Osorno volcano and aquamarine Petrohue Falls. Explore vibrant Santiago, wander picturesque Valparaiso, then discover the beauty of Elqui Valley including a visit to pisco distillery and a tasting of this national drink. Enjoy the solar eclipse viewing in Elqui Valley with picnic including local food and drinks before returning to Santiago. One male share space remaining, don’t miss out! Experience the 2019 solar eclipse in style on this 9-day escorted tour. Start by exploring Santiago’s most popular sights on an exclusive tour of the city. Visit picturesque Valparaiso, then discover the beauty of the Elqui Valley including a visit to a pisco distillery. Enjoy the solar eclipse viewing in the Elqui Valley with a picnic including local food and drinks. Finish off your trip with a 3-night stay at all inclusive Atacama Resort with variety of activities on offer. Why not explore Bolivia & Peru after your once in a lifetime Chile Solar Eclipse tour? Join this 13-day Solar Eclipse extension to travel through Bolivia & Peru. Starting this journey, you will embark on a desert crossing across the stunning mars-like landscapes between Atacama Desert and Salar De Uyuni before visiting the spectacular city of La Paz and observing the highlights of Lake Titicaca. Travel to the Incan capital of Cusco and see some of the world’s most famous Incan Ruins – Machu Picchu before you appreciate the beauty of the Sacred Valley of the Incas. View the extension tour details here. Witness a great natural wonder – a total solar eclipse – in one of the most spectacular regions of the world on this twelve day tour of Chilean Patagonia. Discover the cosmopolitan city of Santiago’s thriving art and food scene before heading south to the Lake District. Explore towering conical snow-covered volcanoes and peculiar monkey puzzle trees; marvel as the world is plunged into complete darkness during the eclipse; and wander the streets of colourful Puerto Varas. Finally continue south to the imposing mountains and aquamarine lakes of Torres del Paine National Park. Join us for a tour of Northern Patagonia and Buenos Aires including an unforgettable solar eclipse. Take in the enchanting city of BA, exploring it’s cosmopolitan and vibrant barrios. A short flight south brings you to Northern Patagonia’s lake district. Discover the spectacular natural beauty of Bariloche’s huge snow-capped mountains and deep blue lakes before observing the eclipse. The buzz continues with a captivating drive along the scenic seven lakes route to San Martin de los Andes and the nearby Lanin National Park. Return to BA for a tango show and one last steak before heading home! 10th June 2021 – Save the date! 14th October 2023 – Save the date! 2nd October 2024 – Save the date! 12th August 2026 – Save the date! 2nd August 2027 – Save the date!